In my previous post, I discussed the 7 focus areas for the New New Product Owner, as well as the “Product Value Maximizer” focus area. In this post, we explore the “Product Marketplace Expert” focus area. The New New Product Owner should be expertly aware of the marketplace for the product. They should constantly be gathering and re-gathering information and data regarding the marketplace, so that the product value is maximized. Getting out of touch with the marketplace can be a recipe for product disaster. Note here that the New New Product Owner may or may not be the one doing the legwork of gathering the marketplace data(they might delegate), but they should certainly be aware of the market research. Often times the New New Product Owner will delegate to others or to automation to aid them in obtaining the market data. Note that your market might be internal (IT software) or external (Saas, Consumer software). Either way, it’s important to gather the marketplace data. With IT software, the market data will often include how the LOB(Line of Business) uses the software, as well as understanding the business function that the LOB executes on. Heavy interaction with those in the LOB will usually yield this data, or again, the New New Product Owner might delegate or rely on someone in the LOB to supply her with that data. A good starting point for gathering this data is understanding who your key stakeholders are. Additionally, the New New Product Owner should never be afraid to change the vision or tactics based on marketplace changes. Being able to strategically re-pivot and capture value in new and different ways is one of the key benefits of an Agile mindset. For a high quality class that focuses exclusively on the Product Owner role(the course is also great for key stakeholders! ), see our Professional Scrum Product Owner class and contact us if you’re interested in one. The New New Product Owner communicates all of this marketplace knowledge to the Scrum Team through daily ad hoc interactions as well as Product Backlog Management, Product Backlog Refinement, and in Sprint Reviews. Knowing the market for your product can help you fulfill another key focus area, being The Product Visionary. The New New Product Owner: The Product Value Maximizer in Scrum. Preface: In the last 4 years, the Scrum Guide has had two very significant updates, including updates to the Product Owner role that have far reaching implications. 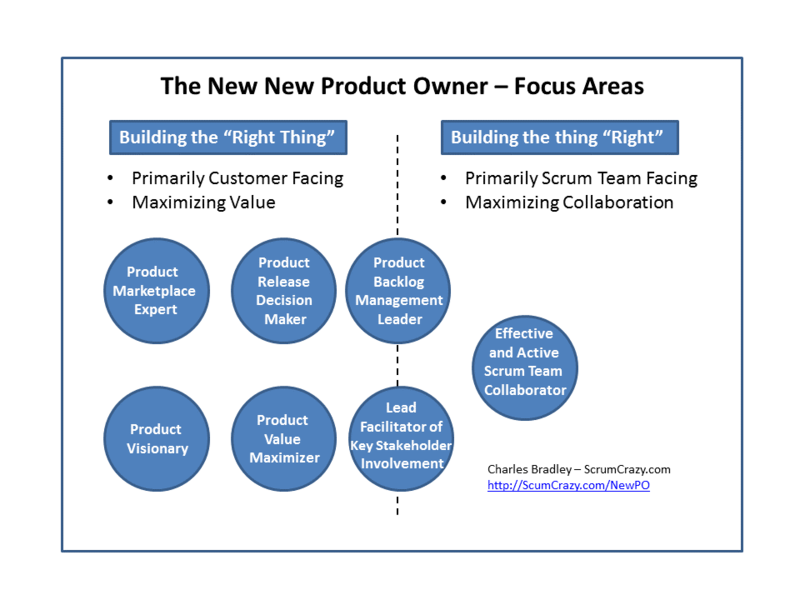 In this article and the series that follows, I attempt to describe “The New New Product Owner” role in Scrum. In a series of upcoming articles, I will detail the different focus areas that the modern Product Owner needs to concentrate on in order to fulfill their duties on a Scrum team. The New New Product Owner understands that she will likely need to execute these activities at different times, and that she might need to delegate to others in order to effectively produce software that maximizes ROI for the software development effort. Order the Product Backlog by (estimated) value. Work with the Development team to get small increments of value to market quickly, for feedback. Release to market = in production, available to end users. Rapidly assess value delivery feedback from the market, and then start over again at step #1. Note that your market might be internal (IT software) or external (Saas, Consumer software). Either way, it’s important to get features into production quickly, and to assess whether we have “hit the target” with respect to value… or not. This quick release to production, every few weeks, is a key aspect of Agile software development. If you haven’t already signed up for our blog, be sure and sign up (upper left hand corner) so you will get the future articles on this topic! For a high quality class that focuses exclusively on the Product Owner role(send your business stakeholders too! ), see our Professional Scrum Product Owner class and contact us if you’re interested in one. We teach all over the USA. New and Improved User Story Lifeycle Diagram — Free Creative Commons PDF download! What does Product Backlog Grooming Look Like? The best book on the subject of User Stories, IMO, is Mike Cohn’s User Stories Applied. For good advice on how to split User Stories, see Richard Lawrence’s Story Splitting Flow Chart. For a good article on why to split User Stories, see Mark Levison’s Story Splitting, How Small is Enough?